London, Dec 13, 2010 (Global Fashion Wire) - "Mulberry has continued to increase sales and profitability during the first half of the year due to consistent demand for our products in all markets. Since September 2010, the pattern of strong demand has continued and the outlook for the second half of the year is very positive, with the full year performance likely to exceed market expectations. Despite the positive outlook we remain cautious about the global economic environment." Commented Godfery Davis, Chairman and Chief Executive Officer. The Mulberry Group has continued to deliver strong sales and profit growth during the six months to 30 September 2010 with sales increasing 38% to GBP44.7 million (2009: GBP32.3 million). Mulberry saw its retail sales in stores start the year well with the Autumn/Winter 2010 collection being well received as retail sales for the six month period increased by 30% compared to the prior year (like-for-like up 29%). UK Retail sales increased by 27% (like-for-like up 26%) and the UK full price stores and concessions were up 36% (like-for-like up 35%). 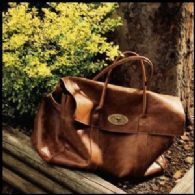 Mulberry also saw sales through the website, www.mulberry.com, grow by 32% during the period, representing 7% of Group sales (2009: 7%). In addition to being a profitable and growing sales channel, the website is a key marketing tool for the brand. In the USA, business is trading significantly ahead of the plan that was set during October 2009, when Mulberry purchased two stores in New York and took back responsibility for the full distribution rights to the North American market. The stores have recorded sales increases of 102% compared to the prior year whilst the wholesale and online businesses have also increased satisfactorily. In France, sales in the small Rue St Honore store increased by 189% compared to prior year. Wholesale shipments to customers during the six months to 30 September 2010 were up 76% compared to the prior year. The Wholesale business includes sales to the European franchise partners, European and USA independent retailers and department stores as well as international franchise partners who run Mulberry stores in Asia and the Middle East. In Asia, sales grew more quickly than the rest of the world with the Korean market being a leading contributor. Mulberry's partner stores report good sell through and that Mulberry's bestselling products are successful in all markets. The order book for Autumn/Winter 2010 finished 100% ahead of the previous year. Mulbery have a mature wholesale business in the UK but despite this, orders increased by 46% compared to Autumn/Winter 2009, with particularly strong growth from Net-a-Porter and Selfridges. In the latter case, Mulberry opened a new larger shop-in-shop within their Oxford Street flagship store during May 2010 which resulted in a dramatic increase in business. Bags and accessories remain our core business and continue to account for over 90% of Group sales. The Alexa handbag family has joined the successful Bayswater, Daria and Mitzy ranges as one of a stable of best sellers. In addition, we continue to develop and grow the women's apparel and women's shoe businesses. The strong consumer demand for Mulberry products experienced during the six months to 30 September 2010 continues. During the ten weeks to 4 December 2010, Mulberry's total Retail sales were 47% above last year with like-for-like sales up 47%. Within this figure, UK full price retail sales have grown by 66% like-for-like compared to the outlet business decline of 6% like-for-like, boosting margins. The Spring/Summer 2011 season started extremely strongly with the third party wholesale order book already 91% higher than the Spring/Summer 2010 closing position with four months selling yet to go. During January 2011, Mulberry will deliver the new Tillie family of bags, which has been well received and will join the already strong product line up. During the period, new Mulberry stores have been opened by our partners in Hong Kong, Korea, Qatar and the UAE. The Mulberry network of stores continues to develop. On 1 December 2010, the company opened its new flagship store at 50 New Bond Street, London and closed the old flagship store at 40-41 New Bond Street. This week, Mulberry opens its new Spinningfields store in Manchester. A new store has recently opened in Sydney, Australia as well as a concession in the De Bijenkorf department store, Amsterdam. Looking further forward, Mulberry is in the final stages of agreeing terms on a new 5,000 sq ft flagship store on Spring Street, Soho, New York, which will mark the beginning of the next stage of development of our USA business. During March 2011, the Group will move into its new London headquarters on Kensington Church Street, bringing all the London teams under one roof for the first time and providing excellent showroom facilities. The net cash cost of this project will be in the region of GBP4 million which will be incurred largely during the second half of the year. We continue to build production capacity with our partners around the world, in order to meet the rapidly growing demand. In the UK, we have planning consent to expand our factory in Somerset and construction will start before the end of the current financial year. This will add more than 30% to our UK capacity and is projected to generate over 60 new manufacturing jobs, which will include school leavers who we will train under our apprenticeship scheme. On the basis of current trends, the Board expects the financial performance for the full year to be ahead of market expectations.